Woot! We've just passed the 3000 signature mark! Thanks to everyone who is passing this on, and all of you who sign it and check back on the progress. I'm getting lots of great comments on the petition. While we are writing letters to Peter Jackson and other stars of the Lord of the Rings films, our hopes for PROJECT FIVER's success lie in the "Six Degrees" connections of people that sign it: Someone might have a daughter who's married to a Production Assistant to a director, or see the same therapist as a Key Grip for WETA, and pass this along to them. This "Six Degrees" effect has already resulted in many friends getting back in touch with us that we've lost over the years, and we're thankful for that as well, it's just icing on the cake. I want to take a moment to thank someone personally. My friend Jay and I go back to our years as "Gem Clear Warriors" at Lipscomb Hall at the University of Georgia. He's always been a talented artist, and has recently turned to making ceramic buildings in miniature. 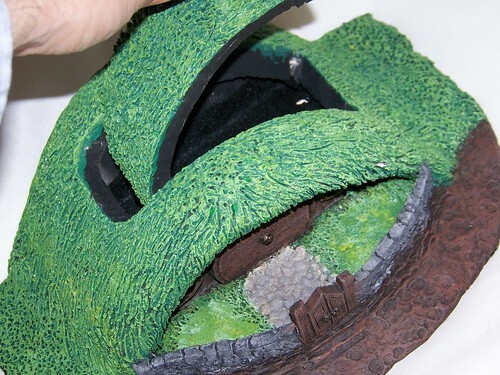 Sometimes we use them as set pieces for gaming, but all of them are incredibly detailed. 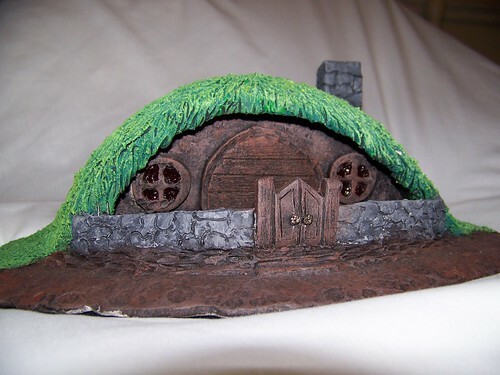 He made this Hobbit "Treasure House" for Melissa in a single day. Isn't the work on this incredible? So thank you for your support and signatures. And keep them coming! Congratulations! I recently did another push on the Farscape and Wolf Pack forums and I know several more people signed. If I could make a recommendation, I think you should do another post on the Dragoncon livejournal, that's where I first found out about Project Fiver. Your point about WETA is interesting - I might be within a few degrees of WETA through Farscape, let me explore that. Best of luck - I will pass along a quote from my friend Chris: "Best petition I ever signed."